Using math board games to reinforce basic computation skills, mathematical reasoning, or even to teach new concepts is a very smart way to educate. Not only is it fun for the student to learn this way, but math board games make the teaching more effective by providing hands-on learning for the student. No doubt about it, knowing your basic facts is one way to become math savvy. Math teachers often spend lots of time in the early grades helping kids to master these basic facts to help improve their overall math performance. Shut the Box, also known as "Canoga" or "Batten Down the Hatches", was a gambling game at one time. However, this traditional game has resurfaced. As it turns out, it is an excellent way to teach basic operations. It consists of a box with hinged numbers and a pair of dice. The player rolls the dice, and then can turn down any two numbers that equal the total number rolled. A classic game for the classroom, Quizmo is a bingo style game. The caller calls a problem (such as 8 x 3), and the player finds the correct answer on his/her scoreboard. 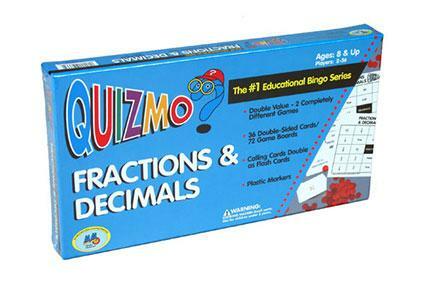 There is a Quizmo for each of the operations, as well as fractions, decimals, and math vocabulary. S'math is a Scrabble like game where instead of letters, kids use numbers and math operation signs to create a crossword puzzle board. In Totally Tut, players race to build their pyramids using both basic math skills as well as the order of operations. Being able to use money, understanding how it works, and being able to apply that knowledge to real life is invaluable. Kids should start practicing with money as early as possible by counting pennies and nickels and dimes. Once they graduate from basic counting, the following games are great to reinforce skills and drill more complicated money concepts. Of course, Monopoly is the classic board game for learning how to count money. While it's not very practical to hone making change or learning every day money skills (after all, who of us has $10,000 bills laying around? 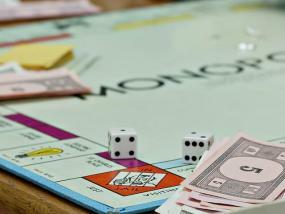 ), Monopoly can help kids learn the ins and outs of spending money and get a good grasp on essential money sense. This is one of the best games to teach kids about money, Pre$to Change-o helps kids become efficient at making change. Decisions is a Monopoly-style stock market simulation game. Players buy stock, sell stock and simulate real conditions that cause the stock market to rise and fall. Fractions tend to be one of the hardest mathematical concepts for kids to grasp. Use these board games to build confidence in working with fractions. Pirates and Plunder, Sink the Ship, Over and Under, and Down and Around use fraction problems and an incredibly creative plot to help kids get the hang of adding and subtracting fractions and finding the greatest common multiple and lowest common denominator. Muggins is a great game for building confidence in working with fractions. Educational Learning Games has tons of great games for teaching and reinforcing math skills. Board Games Express has many educational board games and also offers reviews of games. The time spent playing math games is time well spent. Kids will have fun while learning important math concepts that will serve them well throughout their lifetimes.